After making a giant batch of vanilla bean creme brulee for New Year's Eve, I found myself with another round of extra egg whites and cream. I had just made a delicious raspberry cocoa pavlova, so I wanted to do something a little different this time. 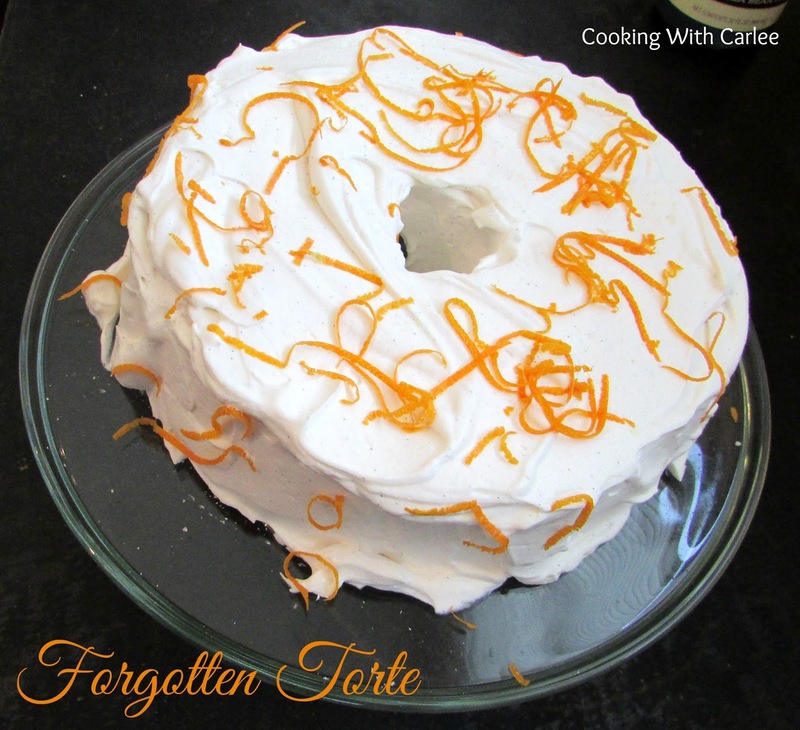 This forgotten torte is more or less the same ingredients as the pavlova, but the texture and presentation is completely different. It was so much fun to give this a try. I had only heard of the forgotten torte recently so it was exciting to make one come to be so quickly. It is hard to describe the texture of this torte. It ended up having a nice crunch bottom with a much softer cake-like texture to the body than you would imagine. 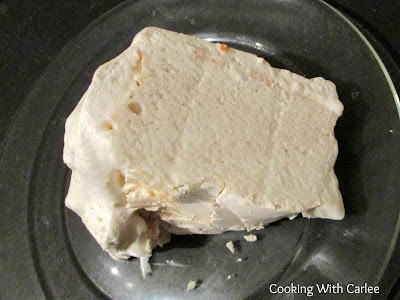 It was a really interesting cross between a soft meringue like a pie topper and a crunch meringue cookie. The whipped cream makes it delicious. This is one you will have to try to get the full experience. Butter the bottom ONLY of a tube/angel food pan. Be sure not to butter the sides. In your mixer, combine the egg whites, salt and cream of tartar. Mix on medium until frothy. Slowly add sugar. You want to add it a bit at a time and make sure it has a chance to be fully incorporated before you add more. Beat until egg whites form stiff glossy peaks. Stir in vanilla and almond extract. Spoon into prepared tube pan and spread evenly. Place into preheated oven, shut door and immediately turn oven off. In the morning, run a knife along the edges of the pan. Unmold onto serving dish. You can leave it like that until you are closer to being ready to serve. Whip cream, sugar and vanilla bean paste. Spread over torte. I zested an orange, allowing the spray from the process to land on the whipped cream and sprinkled the zest around the torte. You would be surprised how much orange flavor this gave the dessert! It was so good. Serve immediately or refrigerate until ready to serve. The torte holds well in the fridge. Heaven!! So many if my favorite ingredients!! I could never "forget" this torte, it's ine to be remembered by my taste buds, lol!! This is a new one for me and that's not easy to do - I read cookbooks like novels, the older ones, especially! Sounds delish and I'm always looking for ways to use up eggwhites - other than omelettes. Which I only make if I'm feeling virtuous and then I don't really like anyway!! haha! I couldn't wait to try it once I heard of it! It was certainly new to me too. The orange zest is not traditional, I just thought a little orange would go well with it and brighten it up. I seem to have extra of either yolks or whites a lot lately. I should do egg white omelettes with them, but pavlovas, pastas and this forgotten torte are so much more fun! It was so much fun to try. I really loved how it turned out and was so surprised by the texture! I had never done anything quite like this before either, but it was so much fun to try! Thanks so much for hosting! Wow, you did it again, tempting the Blogger's Pit Stop. That is so different, the torte. I had to follow the link to your pavlova, seeing it is almost a national emblem here. You did a good job of it. This looks so good! And you've made it even better by introducing me to a new dessert that doesn't have flour! I am gluten free and it's difficult to find a dessert that I would be able to eat, that my family will love too, without having to jump through all the gluten free flour hoops! Pinning, this is definitely going to be a dessert we are going to try! Thanks. This is a perfect way to make a gluten-free dessert. I hope you try it and love it! How interesting and very tempting :) Thank you for sharing your recipe with us at Snickerdoodle Sunday! Pinning and tweeting to share. It was fun to try it! I knew I had to try making one once I heard about it! Thank you so much! I've never tried a torte before but this looks amazing, Carlee! I hope you give it a try, it was a treat! What a beautiful Torte, it looks delicious. Hope you are having a great day and thanks so much for sharing with Full Plate Thursday. Thank you, Miz Helen! We really had fun trying this. I was excited that it worked out much like it was described to me. This looks delicious, Carlee. Pinned and Tweeted. Thank you for sharing your wonderful recipes at Snickerdoodle Sunday! Thank you! We really enjoyed it. Thank you so much for stopping by and sharing! I am pinning this to make over the weekend. If it turns out even half as good as what it promises to be I will be featuring it in my January 2016 roundup. Yay! I hope you love it and I can't wait to hear how it turns out for you! It really is a lot easier than it seems, but I don't blame you. I hope you are offered one along the way ;-) Thanks for hosting! What a pretty looking cake. I bet it tastes delicious. Thanks for sharing the recipe at Cooking and Crafting with J & J. It is really good! I was so excited to see what the texture was like. It is fun to see how the same ingredients made in a different way can produce such different results! Oh my this looks wonderful! Thanks for sharing on What's for Dinner! Delicious! I seriously need a stand mixer. Thanks for joining us at #SaucySaturdays. They are REALLY handy to have, mine gets quite the workout! Thanks so much for hosting! This looks so delicious, Carlee. I have never tried a torte but might have to give yours a try. Thanks for sharing at Funtastic Friday! This recipe was a fun and easy one to start with! I hope you enjoy it! Thanks for stopping by! Way more fun than omelettes! I hope you give it a try next time you have extra egg whites. This looks so good! And you've made it even better by introducing me to a new dessert that doesn't have flour! I am gluten free and it's difficult to find a dessert that I would be able to eat, that my family will love too, without having to jump through all the gluten free flour hoops! Pinning, this is definitely going to be a dessert we are going to try! It is nice to have some naturally gluten free desserts, I would imagine. It seems like the gluten free flours are on the pricey side, though I am sure they are worth it! I hope you love it! I am planning to make this for tomorrow. We won't eat until dinnertime. Would you leave out the meringue all day? Or ice it with the whipped topping, and then refrigerate until later? Just curious. I've had this before, and love the crunchy pieces of meringue but worry that the refrigerator will make them soggy? How exciting! I left mine out most of the day, but frosted it a couple of hours ahead of time amd refrigerated it from that point on and really loved the texture. I'm with you though and would think the longer it's in the refrigerator the less likely it will have crunchy bits. You have me wanting to make this again. It's a bit humid still in my neck of the woods, but hopefully soon!